Both Acer and ASUS monitors provide us with the absolute state-of-the-art technology on the market when it comes to gaming displays. The very first gaming monitors with 4K resolution and 144Hz refresh rate are brought to us by none other than these two rival companies. When we are looking for a new display, we often come across multiple monitors with the nearly identical specifications and price tags, forced to make the decision based on manufacturer’s reputation, a recommendation, or our own personal experience and preference of the company. 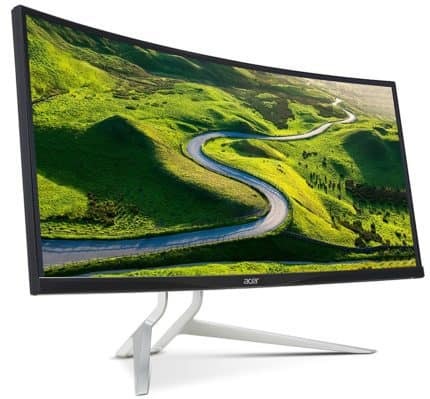 Acer is known for premium and high-quality monitors ranging from the budget displays for everyday use to the high-end gaming and photo editing monitors. In this buyer’s guide, we’ll present you with the best Acer monitors for gaming, everyday use, and professional purposes currently available. Additionally, we’ll fill you in on everything you need to know when purchasing a new monitor including what’s the ideal resolution, refresh rate, and panel type, among other things, for your needs. All of the monitors in the table below are tested and thoroughly reviewed and will undoubtedly satisfy your demands as long as you follow our guidelines to ensure you get the right display for you. In addition, you can search for more thorough individual reviews on our website. The factor that has the biggest impact on the image quality, is the type of monitor’s panel. If you’re looking for a display for competitive gaming, a monitor with a TN (Twisted Nematic) panel will provide you with the fastest response time speed of 1 millisecond. The response time implies pixel transition time, or how fast a pixel changes from one shade into another, and shouldn’t be confused with input lag – which we’ll get into later. Thanks to the rapid 1ms response time speed, you won’t encounter any motion blur in fast-paced competitive FPS games which makes the TN-panel gaming monitors mandatory for professional gaming. However, such quick response time comes at a cost of image quality as in comparison to the IPS and VA panels, the colors appear rather washed out. 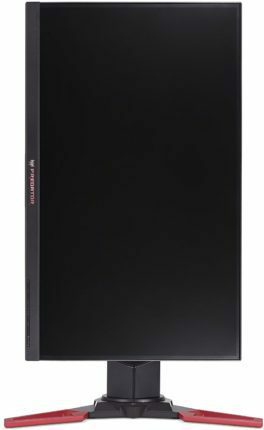 Furthermore, the TN monitors suffer from bad viewing angles (170° vertical and 160° horizontal) which results in color and contrast shift when the image is viewed from certain angles whereas the IPS and VA panels have 178-degree viewing angles. If you prefer image quality over pixel transition performance, you can choose between the IPS (In-Plane Switching) and VA (Vertical Alignment). Both are equally good and have their advantages and disadvantages. The VA panel has a higher static contrast ratio which results in vivid and truly black colors. In fast-paced games, this can cause prominent ghosting or motion blur of the fast-moving objects, particularly where dark pixels are involved. The IPS, on the other hand, have only basic contrast ratio so the black tones aren’t as deep. But, the colors are more accurate and consistent; in fact, all professional monitors for color-critical work feature an IPS panel. While ghosting and motion blur isn’t as noticeable (it’s somewhere in-between the TN and VA), the IPS panel suffer from more pronounced backlight bleeding and IPS glow. This is an expected drawback of the panel and it manifests as the slight glow around the edges of the screen with pitch-black backgrounds. It’s more noticeable in dim lit rooms, but it certainly isn’t deal-breaking but rather negligible. You can read more about the different panel technologies here. The next most influencing factor on the image quality is screen resolution. You won’t have to contemplate much here; the higher resolution the better. You should avoid getting a low-resolution display with a too big screen size as it will result in a low pixel density. For instance, a 27-inch monitor with 1920×1080 resolution may be a lot cheaper than the equally-sized display with 2560×1440 resolution, but its picture will have smudgy text and pixelated details when looked up close. A 27-inch 1440p monitor, on the other hand, will display crisp and sharp details with plenty of screen real estate. Visit our 1080p vs 1440p resolution article for more information if you’re on the fence between these two resolutions. The ultrawide monitors, both 2560×1080 and 34401440 resolution versions, deliver a stunningly immersive gaming experience. The lower resolution ultrawides can deliver higher refresh rates for a smoother gameplay while the 1440p ultra-wide monitors max out at 100Hz but offer an otherworldly image quality due to the higher resolution. The ultrawide displays are also great for work and other multimedia activities, especially watching movies, but for best productivity in multi-tasking, you’d be better off with a dual monitor setup. 4K monitors are becoming increasingly more affordable lately and it may certainly be tempting to get one. 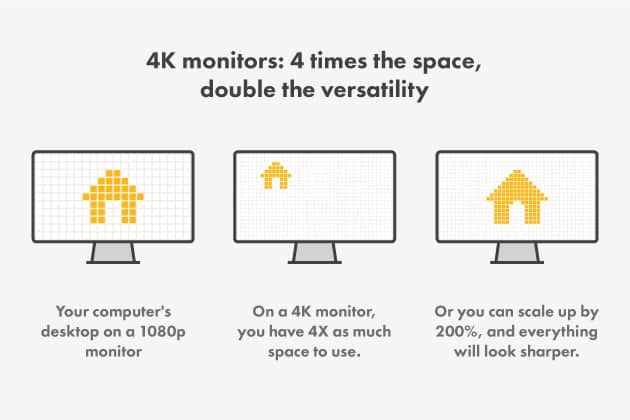 Keep in mind that most of the content out there isn’t quite 4K-ready. But if your favorite games and TV shows come with 4K support, we suggest you go for it as the 3840×2160 resolution makes everything crystal-clear and it eliminates the need for anti-aliasing which results in a vibrant picture quality without the performance cost. However, you will be limited to 60Hz or 75Hz which is not really a problem since getting more than 75 FPS at 4K isn’t quite feasible with the current GPUs. There’s a world of difference between 60Hz and 144Hz. In fact, for the high-end competitive gaming, a 144Hz gaming monitor is mandatory as otherwise, you’d be at a disadvantage. The image refreshes more than twice as fast which gives you the upper hand in professional gaming where every millisecond counts. Certain 60Hz gaming monitors, usually with the help of variable refresh rate technology, can work up to 75Hz. At 75Hz, the gaming experience feels a bit smoother than at 60Hz, but it’s not as nearly visible as it is at 144Hz. Some ultrawide gaming monitors can output up to 100Hz which is arguably less noticeable than the difference between 60Hz and 75Hz, but it does add some extra flow to it, though it also depends on what type of game you’re playing. Professional players can take their gaming to the next level via the cutting-edge 240Hz gaming monitors which deliver state-of-the-art performance. These monitors are currently limited to Full HD resolution and TN panels, so unless fast-paced competitive gaming is the only thing you plan to use your monitor for, pick a monitor with a slower refresh rate but higher screen resolution. Some 144Hz gaming monitors are overclockable to 160Hz-180Hz; these displays will provide you with extra gameplay fluidity, but it won’t be as noticeable as the jump to 144Hz. So, it’s not crucial to go beyond 144Hz, but it’s worth it if you can afford it. Another factor that can improve the gameplay performance besides the high refresh rate is the variable-sync technology. 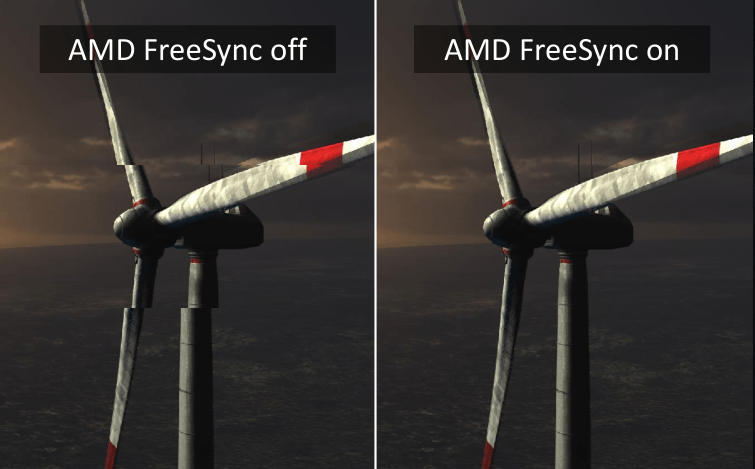 By connecting your FreeSync or G-SYNC monitor to the compatible graphics card, you gain dynamic refresh rate instead of the static. The synchronized dynamic refresh rate thus eliminates screen tearing and stuttering in addition to providing you with a more stable FPS (Frames Per Second) rate at no cost of input lag. In order to work, the variable refresh rate technology needs specific GPUs. For Nvidia G-SYNC technology you need Nvidia G-SYNC compatible graphics cards while AMD FreeSync requires FreeSync-compatible graphics cards. You can use a FreeSync monitor with a Nvidia GPU and vice versa, but you cannot activate the dynamic refresh rate in this case. So, if you already have a variable-sync compatible graphics card, you should make full use of it and get a fitting display. If you plan on getting a new display as well as a new graphics card, you should consider both devices and wisely pair them. Visit our graphics card’s buyer’s guide for more information. 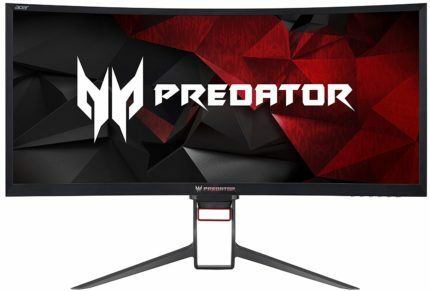 We are anticipating many new ground-breaking gaming monitors in 2019, including the Acer Predator X35 with 200Hz, UWQHD resolution, G-SYNC, and HDR support. Besides breaking the 120Hz at 1440p ultrawide barrier, this monitor will also offer true HDR support. The Acer Predator X27 and the Acer Predator XB272-HDR will feature G-SYNC and HDR as well, in addition to offering 144Hz refresh rate at 4K Ultra HD which is going to demand next-gen graphics cards. 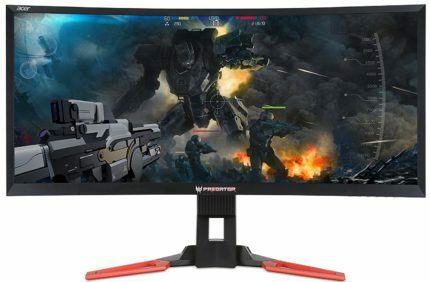 The Acer Predator XB271HU is arguably the best gaming monitor in 2019 and will certainly continue to be popular in years to come. Although no monitor offers everything yet, the Acer XB271HU does offer the perfect combination of specifications which ensures both immersive image quality and smooth gameplay experience. It’s 27-inch in size, so it’s neither too big nor too small, and it features WQHD 2560×1440 screen resolution for the pixel density sweet spot meaning you’ll be able to enjoy plenty screen real estate as well as crisp and vivid details. The Acer XB271HU 27-inch monitor is based on an IPS panel with 10-bit color support through dithering (8-bit + FRC) and a rich 100% sRGB color gamut. The 178-degree wide viewing angles ensure perfect image quality no matter the angle you’re looking at the screen while the quick 4ms response time speed makes for next-to-none ghosting in the fast-paced video games. Furthermore, the monitor provides you with full ergonomic support (VESA, tilt, swivel, height adjustment, and pivot) as well as extensive connectivity including an HDMI 1.4, a DisplayPort 1.2, a four-USB3.0 hub, and 2x2W integrated speakers. The design also features an anti-glare coating, premium build quality, and ultra-thin bezels. Nvidia GPU users can use the full potential of the Acer Predator XB271HU via the G-SYNC technology. In the OSD (On-Screen Display), you can overclock the display from the native 144Hz to 165Hz for extra fluidity. Lastly, the Predator series also offers exclusive gaming features including the crosshair overlays for better precision in FPS games, an FPS counter, and pre-calibrated picture presets. Furthermore, you can enable ULMB (at 120Hz max) if you wish to further reduce motion blur. Note that ASUS also has their version of the display with identical specifications, the ASUS PG279Q but since it’s more expensive at the moment (December 2017) yet basically the same, we advise you get the Acer XB271HU. You can read a thorough comparison between the two displays here. Sure, the Acer R240HY may seem a little bittersweet now after the Predator XB271HU, but it will provide you with an amazing image quality nonetheless and save you a lot of money. 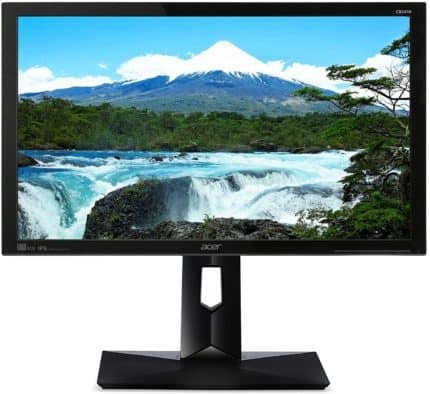 The Acer R240HY 1080p IPS display is the best 24-inch monitor under 200 USD and overall, one of the best budget monitors 2019. The Full HD resolution offers decent pixel density on this 24-inch monitor meaning that the image quality is crisp while the IPS panel ensures vibrant colors, great viewing angles, and fast response time speed. The Acer R240HY features a modern thin-bezel design that makes the monitor look more expensive than it is. However, it’s tilt-only and lacks VESA mount compatibility. Connector ports consist of an HDMI, a VGA, a DVI, and a dual-USB3.0 hub. Overall, it’s the best monitor for the money and it’s a great choice for gaming, general multimedia use, and work. You can read our Acer R240HY review for all the details. For an extra $30, you can get the Acer CB241HY which comes with full ergonomic support including height, tilt, swivel, pivot, and VESA. It also features built-in speakers and HDMI, DVI, VGA ports but has no extra USB3.0 ports. The monitor is also based on an 8-bit IPS panel with 1080p resolution, 4ms response time speed, and 178-degree viewing angles; so, if you wish to easily wall mount your display or full ergonomic support, get the Acer CB241HY. The Acer R271 is the 27-inch version of the Acer R240HY. It offers all the same features and specifications including the 1080p resolution which means that the picture will appear somewhat pixelated if you are sitting close to the monitor. Therefore, it’s recommended for console gaming and movie watching where you wouldn’t be able to notice the pixels as much while the 178-degree viewing angles provide a perfect picture for everybody in the room. 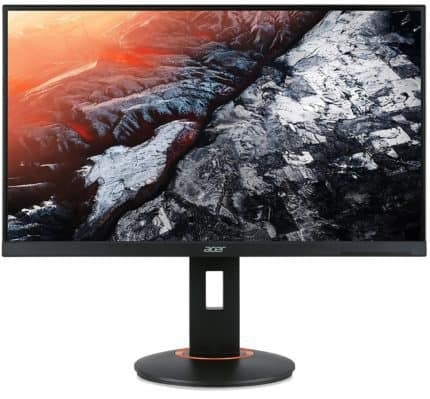 A step up from the standard 1080p monitor is the Acer G257HU which is only an inch larger than the best budget 24-inch monitor but its 2560×1440 resolution will greatly improve your viewing experience no matter whether you are working or gaming. In comparison to 1080p, 1440p will provide you with more vivid details and a lot of extra workspace due to the higher pixel density. 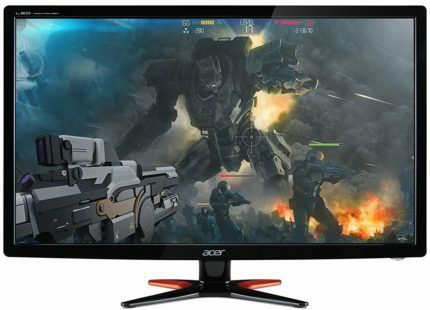 The Acer G257HU LED monitor also uses a high-quality IPS panel with 16.7 million colors, 178-degree viewing angles, and a quick 4ms (GtG) response time speed for minimal ghosting and motion blur in fast-paced games. The design consists of modern thin bezels but it’s tilt-only by -5/15 degrees while connector ports include a DVI, an HDMI, and a DisplayPort. 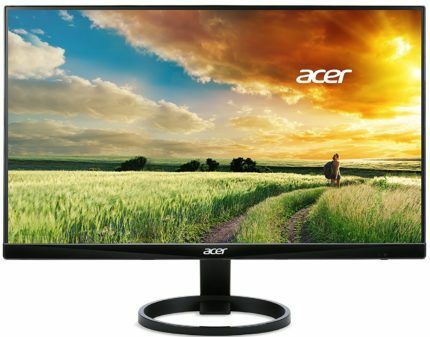 If you want a larger, 27-inch 1440p Acer monitor, you’d have to invest another $50 and go for the Acer 27-monitor K272HUL which is a bit older and overall, not as good when it comes to the value/price ratio. The Acer KG241Q is the best 24-inch monitor for gaming if you have an AMD FreeSync GPU and you mostly play fast-paced games. The display offers 1920×1080 screen resolution up to 75Hz while the TN panel allows for the rapid 1ms response time speed for crystal-clear fast-paced action. If you prefer more graphically oriented games and/or have a Nvidia card, then the Acer R240HY is a better choice for you because of the more vibrant image quality. The Acer KG series also includes the Acer KG251Q which is an inch larger and offers all the same specifications and features. Keep in mind that during discount deals, it can be cheaper than the KG241Q model. Both monitors offer an attractive modern design with thin bezels while the connectivity includes two HDMI ports, a VGA, and an audio line-out. The monitors aren’t VESA mount compatible and are tilt-only by -5/15 degrees. The FreeSync range is 40-75Hz. If you’re looking for a cheap 144Hz gaming monitor, the Acer GN246HL is the cheapest there is, it’s the only 144Hz monitor under 200 USD, although it performs just as fine as the more expensive displays. Its outdated design may trick you into believing that it’s behind the times, but its excellent performance over the years speaks for itself. With the rapid 1ms response time and 144Hz refresh rate, you’ll be able to take your first steps towards professional gaming. When it comes to ergonomics, the Ace GN246HL 24-inch 144Hz gaming monitor offers VESA and tilt abilities while connectivity consists of an HDMI 1.4, a Dual-Link DVI, and a VGA port. The screen of the monitor is coated with an anti-glare matte coating which eliminates the sunlight reflection. Additionally, the Acer GN246HL offers support for the exclusive Nvidia 3D Vision 2 technology. The Acer XFA240H is the best gaming monitor under 250 USD if you’re mainly playing competitive FPS games and have an AMD FreeSync GPU. In addition to the standard 144Hz and 1ms gameplay smoothness, you will get premium build quality with full ergonomic support (VESA, tilt, pivot, swivel, height adjustment) as well as extensive connectivity including a DisplayPort, an HDMI with MHL, and a DVI. Overall, the Acer XFA240H is around $30 more expensive than the Acer GN246HL 144Hz 1ms gaming monitor. As the XFA240H also offers the AMD FreeSync technology, and a much more appealing and versatile design, among other things, it’s definitely worth it. The Acer KG271 is from the same series as the previously mentioned Acer KG251Q though it features a more modern design with thinner bezels. Furthermore, it offers 144Hz refresh rate in addition to the quick 1ms response time speed. It also supports AMD FreeSync. The Acer KG271A FreeSync range amounts to 30-144Hz via the DisplayPort and 48-144Hz via the HDMI. Both DP and HDMI cables are provided in the box while the monitor also features a DVI port and 2x2W integrated speakers. Though we’ve recommended avoiding 27-inch 1080p monitors due to the low pixel density, the Acer KG271A is an exception due to the excellent value/price ratio. Besides, the picture is less pixelated in video games than it is while web surfing or working and even less so if you sit a bit further away from the monitor. In fact, some CS: GO players even prefer lower pixel density monitors as the pixel-y image makes them more accurate. However, in case you can invest another $50, consider the following gaming monitor. For a bit over 300 USD, you can get the Acer XG270HU which should keep you settled for a long time thanks to its crisp 2560×1440 screen resolution, high 144Hz refresh rate, the rapid 1ms response time speed, and AMD FreeSync technology. If we compare the Acer XG270HU to the Acer Predator XB271HU, the main differences lie in the panel difference and the variable refresh rate technology. Sure, the Acer XB271HU is also fully ergonomic and offers some exclusive gaming features but the Acer XG270HU offers essentially the same crispiness and gameplay fluidity at more than half the price. 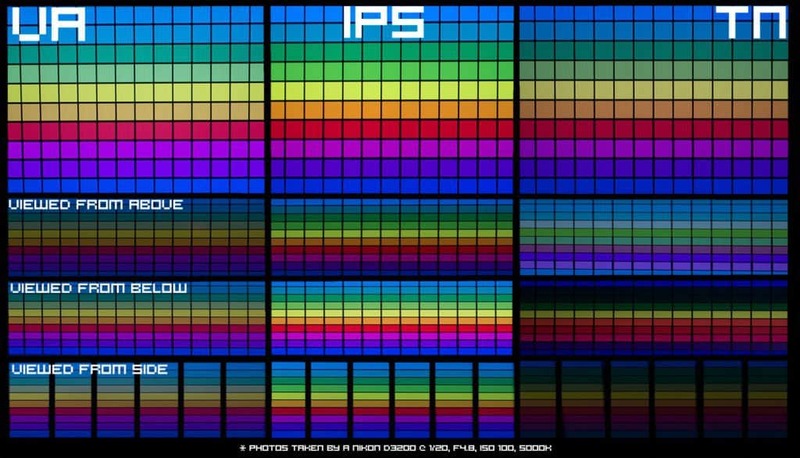 In fact, the gaming experience in fast-paced FPS games will appear even smoother due to the faster response time, it’s just that colors won’t be as vibrant though they are decent due to the true 8-bit panel and 350-nit peak brightness. The Acer XG270HU also offers a wide FreeSync range of 40-144Hz via both HDMI and DP. Connector ports include an HDMI, a DisplayPort, and a DVI-D, there’s no VESA mount and the monitor is tilt-only. There are two 2W speakers and anti-glare coating on the screen. Overall, the Acer XG170HU is an amazing gaming monitor worth much more. We’ve recently reviewed it and you can check a more thorough analysis of the display here. Here we have yet another Acer monitor from the KG series. The Acer KG281K is the most cost-effective 4K gaming monitor available which makes it the best gaming monitor for PS4 Pro and Xbox One X for the money. 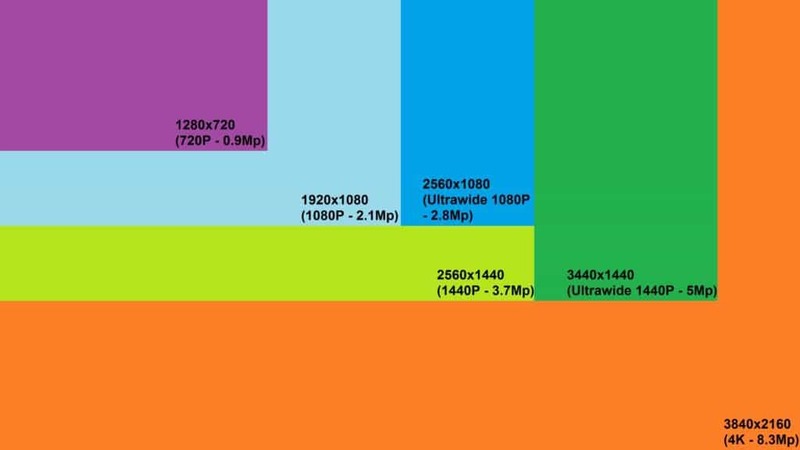 Although it has a TN panel, 10-bit color is supported with 1.07 billion colors which along with the 3840×2160 Ultra HD resolution makes everything crisp and sharp. Due to the high pixel density and image clarity, there’s no need for anti-aliasing in video games which will help with the performance. Another thing helping the performance is AMD FreeSync for those with compatible AMD cards. Connectivity consists of an HDMI and a DisplayPort; there are also 2x4W integrated speakers, VESA mount compatibility, and tilting adjustments available. Curved gaming monitors improve your gameplay experience by wrapping your peripheral vision into the gaming world. Some consider curved gaming monitors just as an excessive gimmick while others can never go back to normal monitors after experiencing curved gaming displays. The truth is, you won’t know for sure until you’ve tried it yourself. 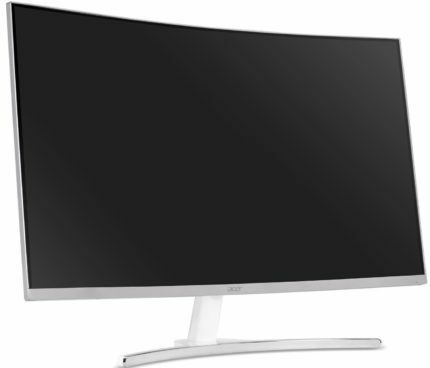 We find curved monitors as an absolute delight due to the more immersive viewing experience, especially if the monitor is ultra-wide. However, if you can’t afford a curved ultra-wide gaming monitor, a flat one will do. There aren’t many 24-inch gaming monitors with high-contrast VA panels but Acer offers two variations. The Acer ED242QR wi with 75Hz refresh rate, and the Acer ED242QR Abidpx with 144Hz. Both monitors feature an aggressive 1800R curvature, AMD FreeSync technology, and 1080p resolution. 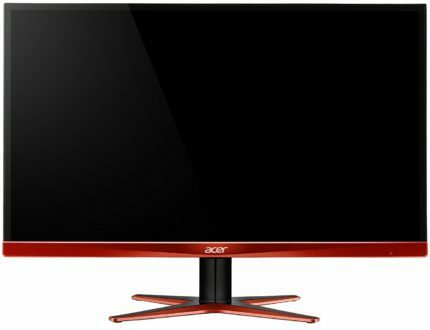 So, if you’re in the market for a 24-inch gaming monitor under 200 USD, you have the following options, mentioned from the least expensive to the most: The Acer KG251Q with a 1ms response time for competitive gaming, the Acer R240HY with an IPS panel but no adaptive-sync, the Acer GN246HL with 144Hz for entry-level professional gaming, and the curved Acer ED242QR with a VA panel and FreeSync. The Acer ED273 curved gaming monitor series consists of the Acer ED273 wmidx with 75Hz and the Acer ED273 Abidpx with 144Hz. Acer really dropped the ball on naming these models, didn’t they? Anyway, these curved gaming monitors offer the same features as the previously mentioned monitors including Black Boost which increases visibility in the darker games. 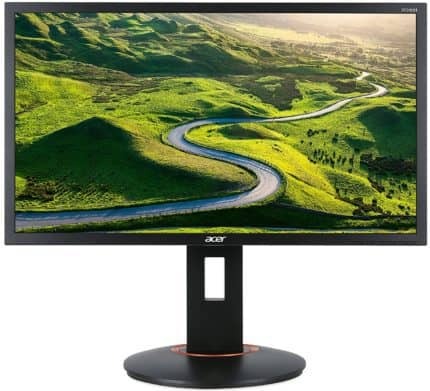 When it comes to the connectivity, the Acer ED242QR and ED273A 144Hz gaming monitors offer an HDMI, a DisplayPort, and a DVI-D while the Acer ED242QR 75Hz version has an HDMI and a VGA, and the Acer ED273A 75Hz display an HDMI, a VGA, and a DVI. The design includes 1800R curvature, tilt-only adjustment, and two 3W built-in speakers. All of the monitors from the series feature a quick 4ms response time speed, 3,000:1 static contrast ratio, 178-degree viewing angles, and anti-glare screen coating. If you need a cheap and reliable 32-inch monitor, the Acer ED322Q is the most affordable one yet it offers a high-contrast VA panel. Alas, its Full HD resolution is too low for its 31.5-inch viewable size which results in a poor pixel density of 70 PPI. Unless you plan to use this monitor for console gaming and movie watching only, you should invest in 32-inch monitor with at least 2560×1440 screen resolution. As you can see, most of the best budget gaming monitors feature the AMD FreeSync technology, that’s because it doesn’t add any extra cost to the monitor price but it works wonders for gameplay performance. The following displays aren’t as cheap but they are significantly cheaper than their G-SYNC counterparts. So, if you have a powerful high-end Nvidia GPU and think that you don’t need G-Sync to smoothen out the performance, you may consider getting a FreeSync monitor in order to save some cash though we recommend against that unless you’re on a limited budget. 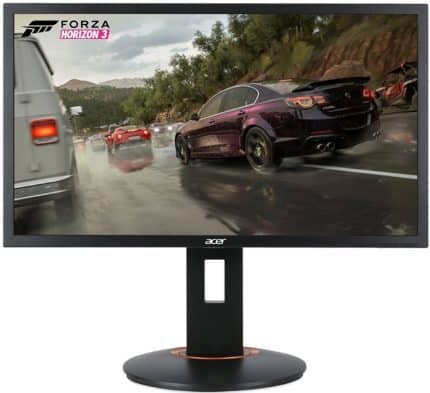 On paper, the Acer XF270HU looks very similar to our pick for the best gaming monitor 2019, the Acer XB271HU. Both monitors feature an IPS panel, WQHD 2560×1440 screen resolution, and native 144Hz refresh rate yet the XB271HU costs $100-$200 more. Whichever monitor you decide on, both smooth gameplay and vibrant image quality are guaranteed, but is the price difference worth it? If you have a high-end Nvidia card, then it is since G-Sync greatly improves the gaming experience and since you would have no need to get a new monitor anytime soon, you could still pair it with new GeForce cards. However, if you could get your hands on a AND RX Vega card, the Acer XF270HU would be a much more cost-effective option. Just like the Acer XB271HU, the Acer XF270HU offers a fully versatile design (VESA, tilt, height, swivel, pivot adjustments) and even more extensive connectivity including an HDMI 2.0 with MHL, a DisplayPort, a DVI-D, and a four-USB3.0 hub as well as integrated speakers. While both IPS panel were developed by AU Optronics, the Acer XB271HU G-Sync monitor provides 10-bit support with 1.07 billion colors whereas the Acer XF270HU is 8-bit only. Moreover, the XB271HU can be overclocked to 165Hz while the XF270HU is limited to 144Hz and lacks premium Predator series game-enhancing features. 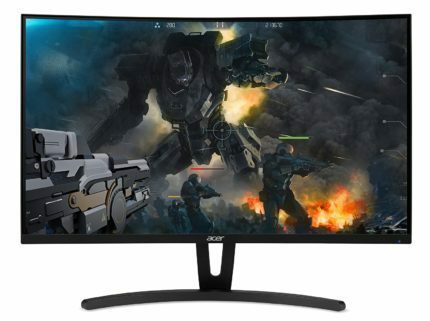 The Acer XR341CK is the best ultra-wide gaming monitor 2019 for the money. It offers just as immersive gaming experience as $1,000 displays thanks to its stellar UWQHD 3440×1440 screen resolution and the high-quality IPS panel with 10-bit support through dithering and 100% sRGB color gamut coverage. Moreover, AMD FreeSync ensures stutter and tear-free gameplay for AMD users while the 75Hz refresh rate and quick 4ms response time speed make for smooth pixel transition in fast-paced games. The monitor offers VESA mount compatibility as well as height and tilt adjustments while the screen is covered with an anti-glare coating. There are a plethora of connector ports available including four USB 3.0 ports, an HDMI 1.4 with MHL, an HDMI 2.0, a DisplayPort 1.2 (with 30-75Hz FreeSync range), and a mini-DisplayPort as well as an audio line-out for the headphones and line-in for the 2x7W DTS built-in speakers. While for professional and competitive gameplay you’d be better off with a 144Hz 1ms gaming monitor, if you’d like to really immerse yourself in the gaming world, the Acer XR341CK is the perfect monitor for you, especially if your favorite games support 21:9 ultra-wide aspect ratio. 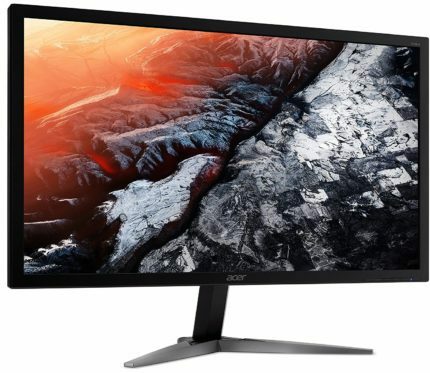 Acer has also released a new version of the monitor, the Acer XR342CK which is essentially identical in terms of image quality and performance. The main difference between the two displays is that the Acer XR341CK has a subtle 3800R curvature while the XR342CK has a more aggressive 1900R. However, the Acer XR342CK newer model also has a lesser FreeSync dynamic range of 48-75Hz. So, if FreeSync isn’t that important to you and you prefer a stronger curvature, go for the XR342CK. Since both monitors are priced similarly, you can also just go for the cheaper one at the time of buying. 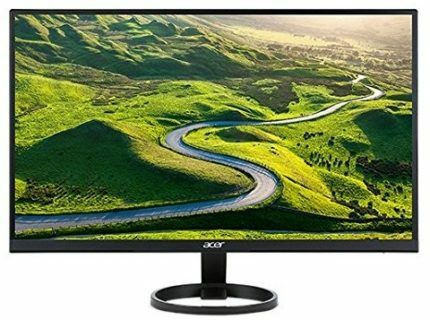 The same monitor is available as yet another variation, the Acer XR342CK bmijqphuzx which in addition to all the goods also offers the USB type C port for simultaneous data, audio, and video transfer as well as charging capacity for compatible devices. Furthermore, this model also provides you with the exclusive 1ms MPRT technology that further eliminates motion blur by regulating the monitor’s backlight in-between scenes. Lastly, the monitor features limited HDR support for compatible content via its edge-lit LED and global dimming. If a 34-inch monitor still isn’t big enough to quench your thirst, the Acer XR382CQK surely will with its massive 37.5-inch viewable screen. In comparison to the XR342CK, this ultimate gaming monitor isn’t just bigger, it also offers a higher screen resolution with 3840×1600 pixels resulting in the sweet spot of 110 PPI which means plenty of screen real estate and striking details and picture quality. You can check a more thorough Acer XR382CQK review for more details. Just like with the Acer XR342CK, Acer has recently released the upgraded model dubbed as the Acer XR382CQK bmijqphuzx (here we go again with Acer’s model labeling…) which also adds limited HDR support, USB-C port, and the 1ms MPRT technology. 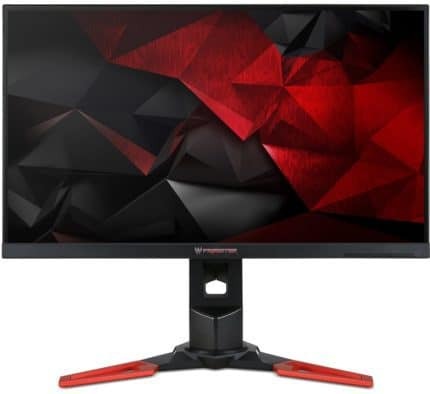 In case you’re looking for a huge and flawless gaming monitor, we recommend you get the newer version since it’s not all that more expensive than the regular one yet it’s a lot better. 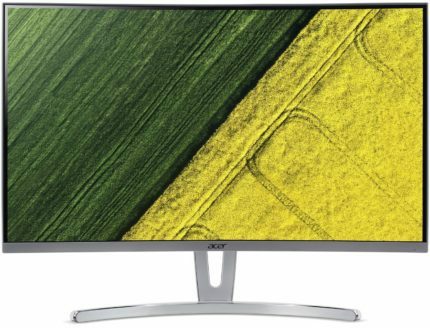 If you’re looking for a 4K IPS monitor with the AMD FreeSync technology, the Acer H277HK is for you. It’s based on LG’s IPS panel with 10-bit color support (8-bit + FRC) and 100% sRGB color gamut which makes it great for professional color-critical work as well as gaming. Connector ports are as follows: an HDMI 2.0, a DisplayPort 1.2 (FreeSync range 40-60Hz), a mini-DisplayPort, and a Dual-Link DVI. There are two 3W DTS integrated speakers but the monitor lacks VESA mount and it’s tilt-only. The Acer CB241HYK is a 24-inch 4K monitor, so you will have to scale everything by 200% in order to see small items. This will also make everything incredibly crisp and sharp; since the monitor also covers 100% sRGB, it can be a great choice for photo editing. In addition, the Acer CB241HYK is fully ergonomic with tilt, swivel, pivot, height, and VESA mount adjustments while connectivity includes a DisplayPort, an HDMI 2.0 with MHL, and a DVI as well as 2x3W integrated speakers. If you have a powerful GeForce Nvidia GPU and want to use it to its fullest potential, getting an Acer gaming monitor from the Predator series will meet all your expectations, and more. The Acer XB241H is the most affordable Acer Predator gaming monitor and it’s ideal for professional competitive FPS gaming. This 24-inch monitor features Full HD resolution, rapid 1ms response time speed, and native 144Hz refresh rate that you can overclock up to stunning 180Hz. For under 400 USD, the Acer XB241H will provide you with everything you need to top any killing board, the rest is up to you. The modern and gamer-inspired design offers versatile ergonomics including tilt, swivel, pivot, VESA, and height adjustments while the connectivity includes an HDMI and a DisplayPort (for 144Hz and G-Sync) as well as an audio line-out for the headphones and line-in for the 2x2W speakers. 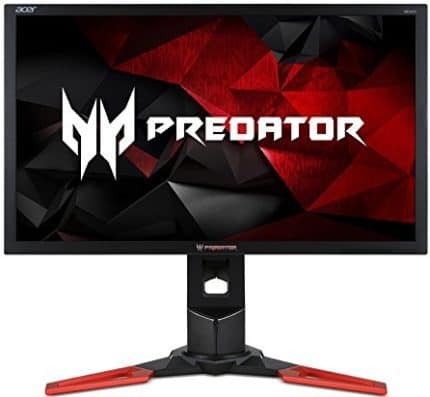 The Acer Predator XB241H 180Hz gaming monitor also offers the exclusive game-enhancing features such as custom crosshair overlays, customizable gaming presets, and Nvidia’s ULMB (Ultra Low Motion Blur) for less ghosting of the fast-moving objects. All Predator gaming monitors are flicker-free and have the low blue light filter which allows you to endure long gaming sessions without eye fatigue. 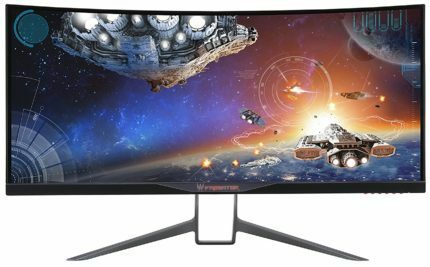 It would be nice if the XB241H existed as an IPS variant, but unfortunately, there aren’t any 24-inch 1080p 144Hz IPS gaming monitors with G-Sync. Based on the same design as the Acer XB241H, the Acer XB241YU brings extra picture crispiness and sharpness thanks to its quad HD resolution of 2560×1440 pixels. It features the same ergonomic abilities and connectivity options with the addition of a four-USB 3.0 hub. 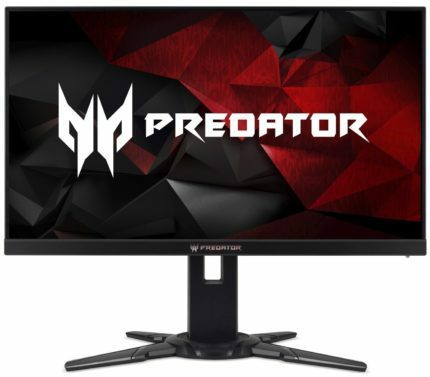 The Acer Predator XB241YU can be overclocked to 165Hz from its native 144Hz refresh rate, so if your GPU is too powerful for high frame rates at 1080p, you can enjoy the premium image quality that 1440p brings on this 24-inch monitor. All of the Predator gaming features are available with this model including the lightning-fast 1ms response time and ULMB. The Acer XB271HU is the 27-inch version of the XB241YU and features all the same specifications. However, due to its 27-inch monitor size and the 1440p resolution, it will provide you with a lot more screen real estate. So, it’s definitely a better choice if you can afford it.. The Acer XB271HK and the Acer XB321HK are the best 4K gaming monitors currently available. If you’re looking for the most vibrant image quality with the smoothest performance at 60 FPS, you won’t find anything better than these two until the new 4K 144Hz gaming monitors arrive. But even when they do, you will have to wait for the next-gen graphics card and well, once they are released, spend a fortune on them…and the new monitor. So, the Acer Predator 4K monitors will be relevant for quite some time. 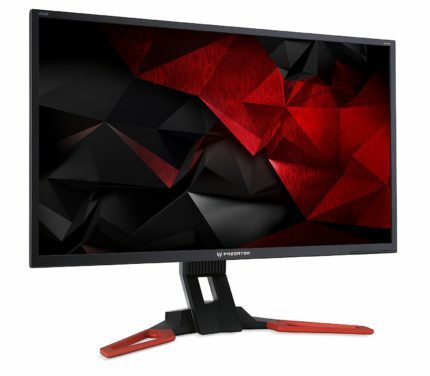 These gaming monitors are based on IPS panels with true 10-bit supports and 100% sRGB color gamut which makes them adequate for professional color-critical work. So, if you’re a designer as well as a gamer, you might have an excuse to get one of these bad boys. Since these gaming monitors max out at 60Hz, ULMB isn’t available but all other gaming features are. Besides, the quick 4ms response time speed is rather enough to eliminate motion blur. 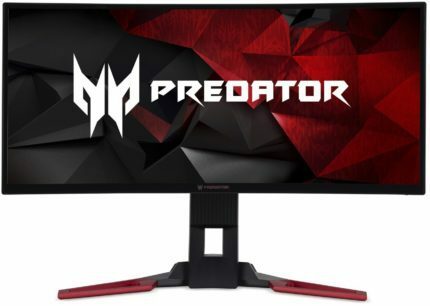 The 32-inch version is usually around $200 more expensive than the 27-inch variant, so you might want to consider saving up if you can’t afford the Acer Predator XB321HK at the moment. When it comes to the ergonomics, the Acer Predator XB271HK has full ergonomic supports while the XB321HK lacks swivel and pivot abilities. The 32-inch, however, has a bit brighter picture (350-nit peak brightness as opposed to 300-nit of the XB271HK) as well as two HDMI 2.0 ports in addition to a DisplayPort 1.2 while the XB271HK has one HDMI 1.4 and one DisplayPort 1.2 Both monitors have four downstream USB 3.0 ports. If you’re not all that into fast-paced gaming but rather enjoy more graphically oriented games without the need to surpass 60 FPS, the Acer XB271HK and the Acer XB321HK are ideal for you. 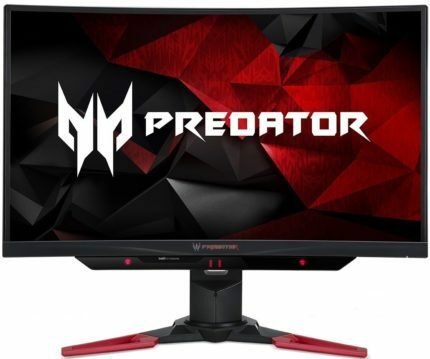 For ~$300 less the cost of the Acer XB271HK, you can get the Acer Predator XB281HK which is a 28-inch 4K gaming monitor with a 1ms response time TN panel. 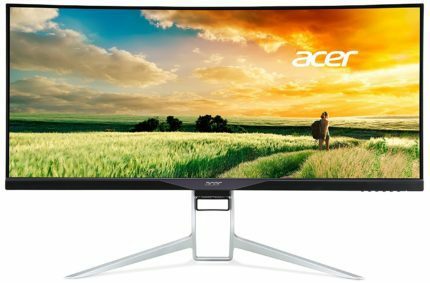 That’s only $100 short for the Acer XB271HU with 1440p, 144Hz, and an IPS panel. So, we recommend you avoid the XB281HK 4K TN display and invest in the XB281HU, XB271HU, or one of the following displays. The Acer Predator Z271T is a 1080p 144Hz G-Sync gaming monitor with a high-contrast VA panel and built-in Tobii Eye-tracking technology. While its panel delivers stunning black colors with 3,000:1 static contrast ratio, the 4ms response time speed and 144Hz refresh rate ensure smooth gameplay, and at 1080p, you don’t need too demanding computer rig for steady and high frames – especially when G-Sync is active. All in all, it’s the best curved gaming monitor with widescreen 16:9 aspect ratio. The Tobii Eye-tracking technology features a built-in camera which tracks your eye movement in order to provide you with a more immersive and responsive gameplay. Supported games offer exclusive features that will improve your gaming experience by providing you with an extended field of view, dynamic brightness regulation, faster enemy targetting, and much more cool stuff. 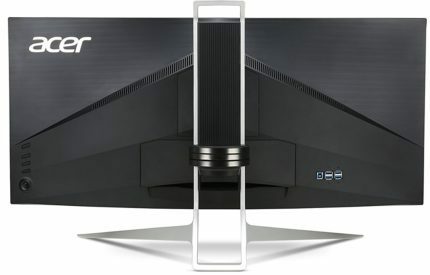 Furthermore, the Acer Z271T from the Predator Z1 series has a steep 1800R curvature for extra immersion as well as two 7W integrated DTS speakers. Connector ports include an HDMI 1.4, a DisplayPort 1.2, and four downstream USB 3.0 ports while the versatile design includes tilt, swivel, VESA, and height adjustments. 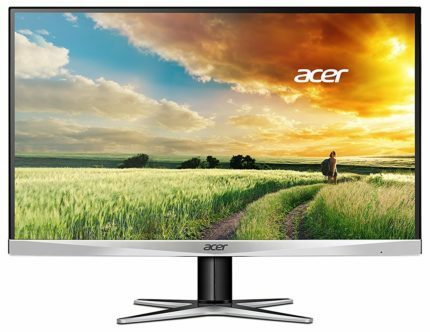 The monitor is also available without the built-in eye-tracking technology, the Acer Z271 which is $150 cheaper. The Acer Predator Z301C also features built-in Tobii Eye-tracking technology but offers a more immersive gaming experience due to its 2560×1080 ultra-wide resolution and the 200Hz overclockable refresh rate. Moreover, its VA panel delivers more accurate colors with 100% sRGB color gamut as well as sharper details due to the high pixel density of 94 PPI. It’s also very ergonomic (VESA, tilt, swivel, height adjustment) with rich connectivity options including an HDMI 1.4, a DisplayPort 1.2, four USB 3.0, and 2x3W speakers. 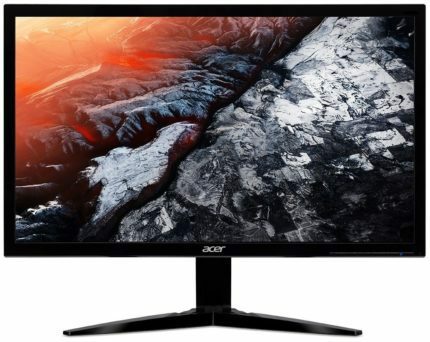 All in all, the Acer Z301C is the best 1080p ultra-wide gaming monitor for the money as it offers both flawless gameplay performance and stunning visuals. Besides G-Sync, Nvidia’s ULMB mode is also available. The Acer Z35 is a bigger version of the Z301C though it doesn’t feature the integrated eye-tracking technology. 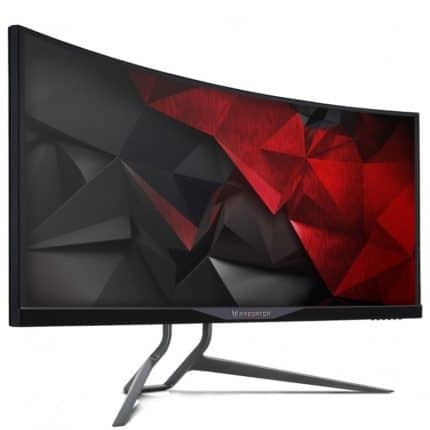 Nevertheless, its huge 35-inch curved panel provides an engaging and intense gaming experience but keep in mind that due to its large monitor size and only decent 2560×1080 resolution, the picture will be less sharp in comparison to the Acer Z301C. If you were to sit a bit further away from the screen, the difference would be barely noticeable – so, it depends on how you prefer to play as well as your budget if you’re on the fence between these two ultrawide gaming monitors. Also note that due to its larger screen size, there’s more ghosting evident on the Acer Z35 than on the Z301C. The Acer X34 is considered as one of the best gaming monitors 2019 by many, and for a good reason, it’s simply flawless. It’s the G-Sync version of the Acer XR341CK and the best display you can get for $1,000 unless you’re a professional FPS player. Although the Acer X34 features 60Hz native refresh rate it can effortlessly be overclocked up to 100Hz. At 3440×1440, that’s more than enough since you’ll hardly be able to get beyond 100 FPS at such resolution with settings turned up. The monitor is based on LG’s 10-bit IPS panel (8-bit + FRC) with 100% sRGB color gamut, impeccable 178-degree viewing angles, and quick 4ms response time speed. The colors are vibrant, consistent, and accurate, so you can also use this gaming monitor for color-critical work. The design features premium build with a subtle 3800R curvature, versatile ergonomics (VESA, height adjustment, and tilt) and extensive connectivity including an HDMI, a DP, a four-USB 3.0 hub, and 2x7W DTS speakers. 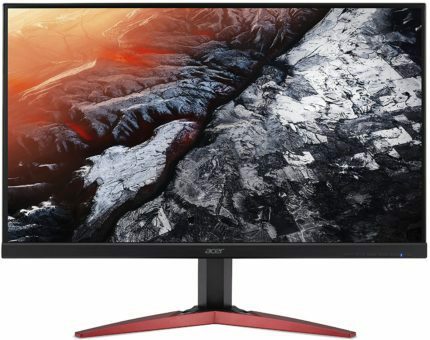 Just like the Acer X34, the Acer Z35P is a 3440×1440 ultrawide gaming monitor with Nvidia G-Sync (but no ULMB) and refresh rate up to 100Hz (120Hz overclocked). The key difference between the two displays is the type of panel. So, both monitors are good in their own way and have their advantages and disadvantages. While the VA panel of the Acer Predator Z35P offers more vivid and deeper black colors, the Acer X34 IPS panel has more accurate colors overall as well as better viewing angles without contrast shifts. Furthermore, the Acer X34 has significantly less ghosting visible while the Z35P doesn’t even offer ULMB. The Acer Z35P is by an inch larger, has a more aggressive 1800R curvature, and a more versatile design with full ergonomic support. Moreover, it has an HDMI 2.0 port in addition to the DisplayPort 1.2, two downstream USB 3.0 ports, and the audio line-in for the 2x9W speakers. Overall, if you’ll be using your ultrawide monitor mainly for faster-paced games, go with the Acer X34 IPS panel version as you will encounter much less motion blur. In any other case, the Z35P would be a better choice due to its higher contrast with true black tones and the more aggressive curvature. Alas, the choice between the two depends solely on what you personally prefer. If you want to get all the edge that you can over your opponents in competitive FPS gaming, the Acer XB252Q and the 27-inch version Acer XB272 are the ultimate monitors. Based on AU Optronics’ 8-bit TN panel (6-bit + FRC) with 100% sRGB color gamut, 400-nit peak brightness, and the lightning fast 1ms response time speed, these monitors deliver the impeccable fast-paced gaming experience at 240Hz. The monitors feature Full HD resolution so that you can achieve as many frames as possible in video games where every millisecond counts. Nvidia G-Sync technology is available if you need help maintaining your FPS rate or if you wish to eliminate screen tearing and stuttering while the ULMB (works at 144Hz max) technology makes for virtually zero motion blur. The Acer Predator XB252Q has a 24.5-inch panel so although it’s smaller, it has a sharper picture quality in comparison to the Acer Predator XB272. Both versions have premium design quality with full ergonomic support (45° swivel, 115mm height adjustment, 90° pivot, -5­°, 20° tilt, and 100 x 100 VESA compatibility) and rich connectivity including four downstream USB 3.0 ports, two 2W speakers, an HDMI 1.4 and a DisplayPort 1.2. The Acer XF250Q and the Acer XF270H are based on the same AUO’s TN panel with basically identical specifications and performance except that they feature AMD FreeSync instead of G-Sync and are hence more affordable. The Acer XF250Q is available for around $350 which makes it the most affordable 240Hz gaming monitor yet it delivers the same state-of-the-art performance when it comes to professional FPS gaming. If you’re interested in the 27-inch version, make sure you pick the right model – the Acer XF270H Abmidprzx. 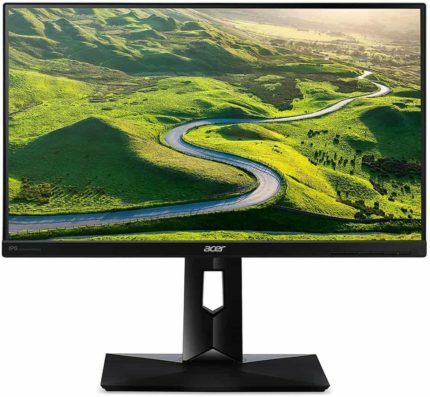 It is often abbreviated as Acer XF270HA in order to avoid confusion as there is another Acer monitors dubbed as the XF270H with 144Hz refresh rate max. That’s strike three for Acer’s sloppy model labeling so far! In comparison to the Acer XB 240Hz G-Sync gaming monitors, the Acer XF250Q and XF270HA have a lesser dynamic range of 48-240Hz via both HDMI and DP ports and lack motion blur eliminating feature such as ULMB. Alas, they are much more affordable, so if you’re $200 short for a high-end professional gaming display and have a Nvidia GPU, you can consider getting the Acer XF250Q model. You wouldn’t be able to activate the dynamic refresh rate, but at such high frame rates, screen tearing isn’t even noticeable anyway. The design of the Acer 240Hz FreeSync gaming models is first-class as well with even more ergonomic adjustments including 150mm height, 60° swivel, -5°, 35° tilt, 90° pivot, and VESA mount abilities. Connectivity consists of two 2W speakers, four-USB 3.0 hub, a DisplayPort 1.2, an HDMI 1.4, and a Dual-Link DVI. That’s it! These are the best Acer gaming monitors currently available. As you can see, there’s quite a lot of them but only one is the perfect combination of everything for your own gaming needs. Hopefully, this buyer’s guide has helped you decide which one is that perfect display for you. 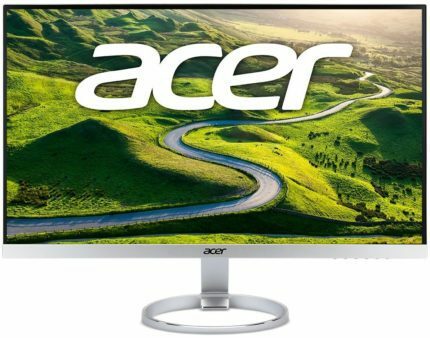 Feel free to check this buyer’s guide again as we will be updating it should a new good Acer monitor pop up.